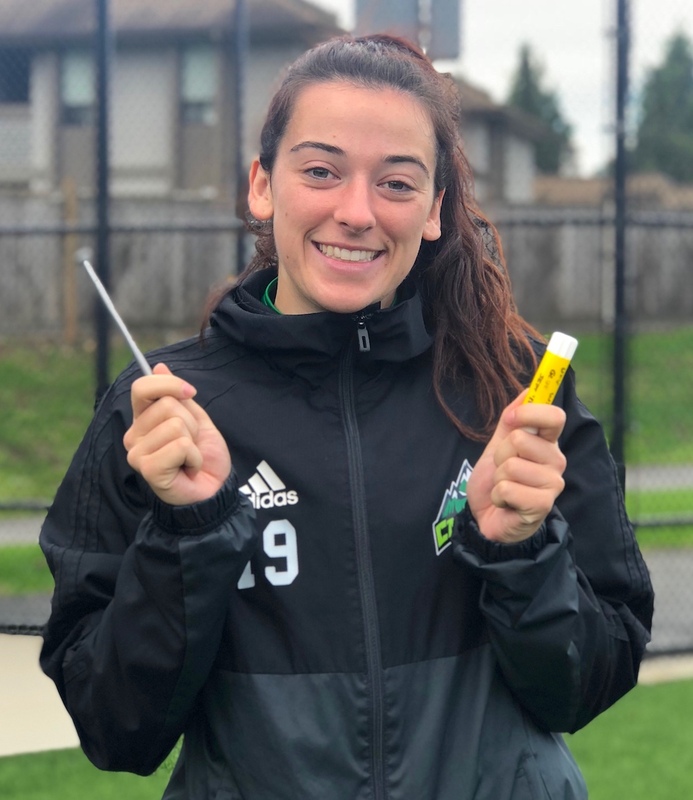 ABBOTSFORD — Toughness and togetherness are a pair of attributes celebrated within the culture of one of the youngest U Sports women’s soccer teams in the nation. So much so that on Monday, before each week of practice is set to begin for Abbotsford’s Fraser Valley Cascades, its players take the time to honour their own by voting for the teammates they feel have best exemplified those two qualities. This week, for only the second time in the last three seasons, it was the same player deemed worthy of hoisting both the Nails award for mental and physical toughness, and the Glue award for the fostering of team unity. Yet there was a lot more to the moment than simply mugging for the camera with a six-inch iron spike in one hand, and dollar store glue stick in the other for fourth-year team captain Brittney Zacharuk, the North Delta native whose six combined points not only led Fraser Valley (3-3-2) to a road sweep of UBC Okanagan and Thompson Rivers, but restored playoff relevancy to a young team preparing for a brutally-tough six game stretch-drive end to its Canada West Pacific Division schedule. When viewed through a wider prism, Zacharuk’s team honour and subsequent selection as Canada West women’s First Star of the Week was confirmation that a one-on-one meeting she had with head coach Rob Giesbrecht before this past weekend’s road swing helped her realize that she had the wherewithal to be both the nails and glue her team needed. “It wasn’t a fluke,” laughed Zacharuk, 21, a history major who had registered two goals and one assist over the first six games of the season, but combined to score three times and assist on two others as the Cascades beat UBC Okanagan 3-1 on Saturday in Kelowna, then blanked Thompson Rivers 3-0 on Sunday in Kamloops. 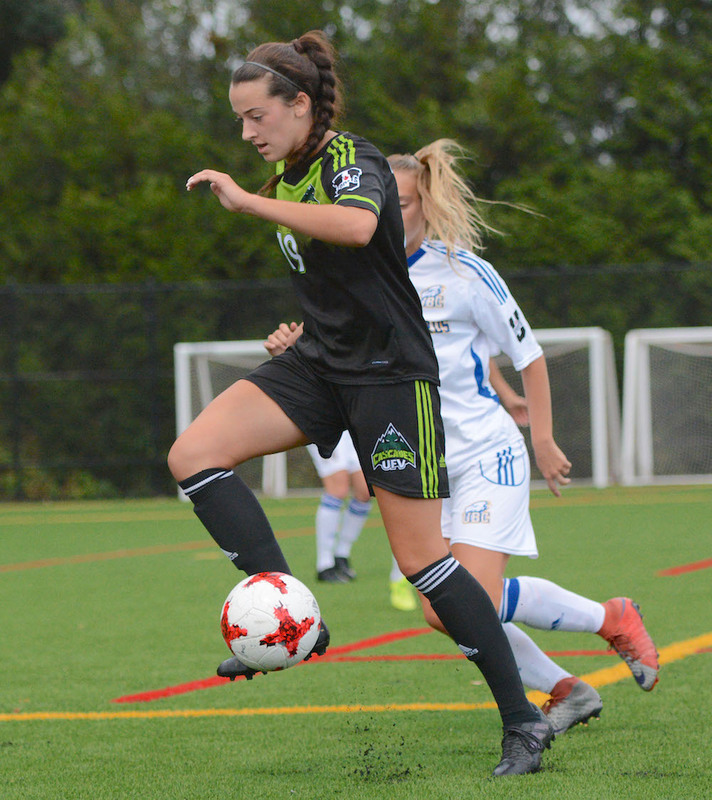 And her re-emergence as a go-to offensive catalyst is somewhat reminiscent of her play as a pure freshman back in 2015 when the TSS-produced Zacharuk scored five goals and assisted on five others after joining a Cascades team which was coming off a berth the season prior in the U Sports national tournament. Back then, like this past weekend, it was all about playing from the heart. “When you have leadership expectations, you can get bogged down from that stuff,” says Giesbrecht, who should have Zacharuk’s best version of herself on the pitch for the regular season’s most challenging games yet, a home-and-home set beginning Friday (5 p.m.) in Langley and concluding Sunday (2 p.m.) at home (MRC Sports Complex) against the Pacific Division-leading Trinity Western Spartans (7-1-0). With the top six in both the Pacific and Prairie divisions making the Canada West playoffs, fifth-place UFV has a challenging road ahead, with each of its five remaining foes sitting at .500 or better. After facing the Spartans twice, the Cascades host Mount Royal (5-2-1) and Alberta (7-0-1) the following weekend, then wrap up Oct. 19 at Victoria (4-4-1) and Oct. 20 at UBC (7-2-0). 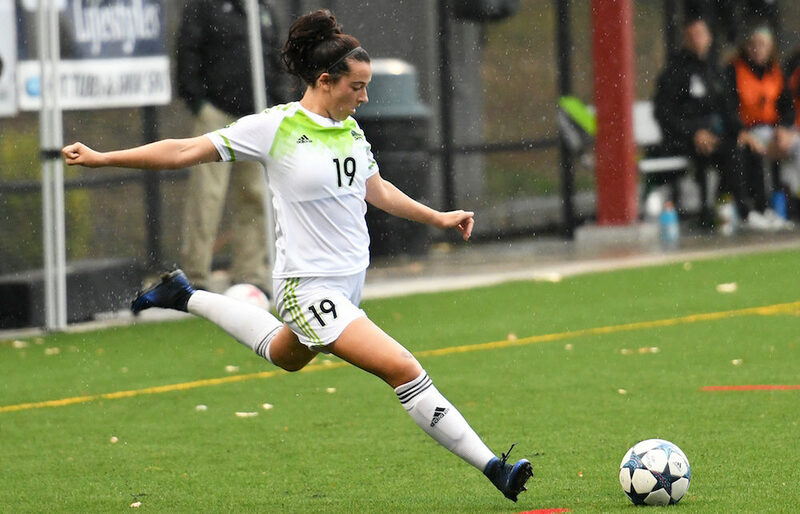 That starts 5 p.m. Friday at Trinity Western, where the Cascades will have to contend with a Spartans’ team led by fifth-year, conference points leader Seina Kashima (5-7-12). Zacharuk’s strategy to lead her team into the weekend with the best balance of nails and glue? “It’s going to be to keep a level head, and to constantly remind the girls what matters most on and off the field,” says Zacharuk, a history major with designs of one day becoming a teacher and returning to Holy Cross, where she formerly played on the school’s varsity soccer team. And perhaps for the first time in her university soccer career, Brittney Zacharuk is empowered by the fact that she can inspire in her teammates, both a toughness and a togetherness. It’s what happens when you have the nail and the glue.